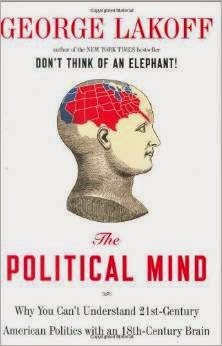 George Lakoff offers a powerful treatment of what recent findings of neuroscience reveal about our political leanings. Our brains think in terms of systems of concepts and the concepts of conservatives and progressives are mutually exclusive. Conservatives think in terms of the strict father figure who must be obeyed because he is the authority. Progressives think in terms of the nurturing parent who can be negotiated with. These two frames cannot simply be changed by using different language because the frames are deeply embedded in our brains by our experiences of the world. Also, he warns that the left-to-right scale is a dangerous misrepresentation of politics because most people are "biconceptual" and have some ideas that fit into a progressive framework and some that would be considered conservative. "Both worldviews exist in the same brain but are linked to nonoverlapping areas of life." The left-to-right scale implies that there is some supposed middle ground between the two frameworks and the radical conservatives are passing off their ideas as this middle ground. The first third of this book, I thought, "Everyone should read this book!" The second third of the book, I thought, "All progressives should read this book." In the last few pages, I started to wonder whether any one should read it at all. George Lakoff presents some very powerful interpretations of why Americans are so divided politically. But he does so from a very biased perspective. In the first third of the book, he seems to validate both the progressive and the conservative framework. However, in the last couple of pages, he deligitimizes the conservative perspective, claiming that the liberal perspective is the one that our "true" democracy is founded on. Despite the work being geared primarily towards making progressives more effective in their framing of issues, I found this conclusion really off-putting. We may not like what others think when they disagree with us, but that doesn't make them any less American than the rest of us. Another issue I disagreed with was his description of the neoliberal mind as that of holding onto the old Enlightenment model of unemotional, deliberate, conscious, disembodied, logical, value-netural, interest-based, and literal. I actually think that the neoliberals have been effective in spreading their agenda because they haven't held onto this antiquated view of how the human mind works. Instead, they have been very effective at activating unconscious emotion, particular that of fear, which can be seen in their campaign against the "War on Terror." It is progressives who are locked into arguing with simply facts and figures, assuming that any rational mind when presented with data, will be persuaded towards their position. I first wanted to review this book because I think Lakoff's ideas are incredibly important to become familiar with, especially if you are a progressive politician or pundit. If you aren't particularly interested in the neuroscience connection, Moral Politics and its abridged version Don't Think of an Elephant are also wonderful contributions to the field. But I found the conclusion of the book really off-putting. It brought down my rating from a five to a four. In an attempt to retain both the red and the blue, I offer a patriotic punch to pair with this book, consisting of a third of a glass fruit punch, a third of a glass blue Gatorade, and the bottom third of a glass 7-up mixed with a tablespoon of condensed milk.